You hear it said a lot, but to really “hear” the Great Outdoors feeling the call to explore the beauty it has to offer, is another thing. 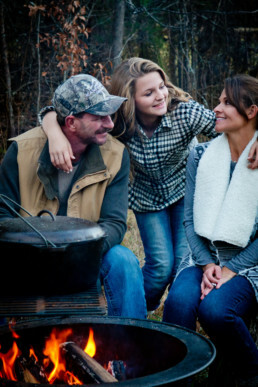 The outdoors is the inspiration to the Earnhardt Collection, so YES, it’s a big deal to our family. Just think about our logo. Earnhardt Collection is about bringing the outdoors into your home. With that in mind, Rene’ and I designed our logo by incorporating a key, tree and the color blue to represent our brand. We also use the tagline “Unlock Your Wilderness”. Sounds pretty outdoor crazy to me and I like it like that! You’ll read a lot in this blog section! We love to camp, cook, hike, ride horses I could go on for days! Of course I can’t write this without mentioning my love of hunting and fishing or I may be banned from the hunt camps with my buddies! Seriously, this is a passionate subject for some, but I hope our stories will enlighten your thoughts and share a little bit about hunting, and fishing for that matter, that you may not have known or understood. I, like anyone who holds a valid hunting license, are wildlife conservationists. Every chance I get to work with an organization to understand their efforts to preserve our wildlife and their habitat, I jump at the opportunity! One of the most important is working with our good friends at the Rocky Mountain Elk Foundation. They are (in my book) one of the best organizations of truly conserving and preserving our wildlife. When I rode along with their biologist to evaluate the young elk in the NC mountains, I was ready and willing to jump in and do anything, even if they gave me the “dirty job”. It was an awesome experience and I sincerely appreciate what they do! Regardless of what you’re doing outdoors, just being there is what matters! See ya in the wild!